The Joseph Smith History is contained in the Mormon book of scripture, the Pearl of Great Price. It is written in Joseph Smith's own words and is an account of his life from the time of his birth until the first printing of the Book of Mormon (May 1829). The writing only contains one chapter and is elsewhere included in the Documentary History of the Church, edited by B. H. Roberts and published in its current format in 1902. 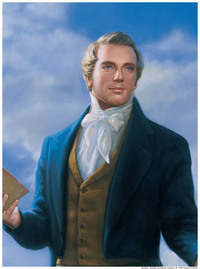 Important highlights of the Joseph Smith History are his First Vision &#151; an account of his vision of God the Father and Jesus Christ as two separate, glorified beings; the visitations of the Angel Moroni, a resurrected prophet who ministered in the ancient Americas; and the translation of the Book of Mormon from "reformed Egyptian" into English. Franklin D. Richards, an early apostle, extracted this part of Joseph Smith's history from the much longer History of the Church printed in the times and seasons (T&S 3:726), and published the extract in 1851. Joseph Smith-History, the name now given to the historical extract, became canonized scripture to the members of the Church when they accepted the Pearl of Great Price by vote at the October 10, 1880, General Conference. Many attempts had been made to compile a history of the early Church, and Joseph even took grammar lessons in preparation. Materials from the previous efforts were assimilated into this new history, which eventually was published in the Times and Seasons, beginning March 1, 1842 (T&S 3:706). Joseph Smith-History, as we now have it in the Pearl of Great Price, was part of this 1839 version of the History of the Church. For many years the Church published Joseph Smith-History as a pamphlet with the title Joseph Smith's Own Story. Missionaries carried it to all parts of the world to help explain Joseph Smith's part in the restoration of the gospel in modern times. To read the Joseph Smith History, click here. This page was last edited on 27 September 2010, at 01:11.